The Red Tailed Zebra Loach is a very attractive fish, especially with the beautiful red coloration on its tail! The Red Tailed Zebra Loach Schistura mahnerti is also referred to as the Salween Hillstream Loach. It is native to Asia, specifically the Salween basin in Thailand. Although it is quite pretty it is not always readily available. This loach has a few other common names besides the two already mentioned, such as Red-tail Sand Loach, Burmese Border Loach, and Burmese-border Sand Loach. The challenge is knowing which loach is which, as these names are also used for other members in the loach families. The Red Tailed Zebra Loach has a bold zebra type patterning of dark vertical bands encircling a light golden to silverish body. The bands are wider across the top and narrow as they reach the mid-section and encircle the bottom. In between them are additional thin dark bands starting just above the mid-section. There is a strong red coloring on the tail and pectoral fins. These are Hillstream Loaches, meaning they come from cool fast-moving streams. 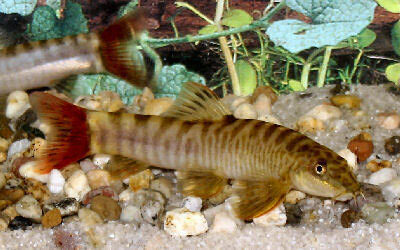 Like other river loaches they are especially designed to cope with living in fast waters. The Salween Hillstream Loach will do best in a cooler "river" type aquarium kept with good water movement and subdued lighting. Provide a large grain sand or small gravel substrate. Be sure to provide plenty of hiding and resting places created with rocks and driftwood. A moderate amount of plants can be a nice addition. Burmese-border Sand Loaches, like other Hillstream Loaches often enjoy the company of their own kind as well as other community fish. Though generally peaceful with their tank mates some species have been known to nip occasionally. Usually this is just among themselves. It is recommended that this Red Tailed Zebra Loach be kept in groups of at least three, with larger groups of five to seven acclimating easier than smaller groups. The Red Tailed Zebra Loach Schistura mahnerti was described by Kottelat in 1990. It is found in Asia; from the Salween basin in Thailand. Other common names it is known by are Burmese-border Sand Loach, Salween Hillstream Loach, Red-tail Sand Loach, and Burmese Border Loach. S. mahnerti is not listed on the IUCN Red LIst. These loaches live in the Salween River, which starts on the eastern slopes of the Himalayas and along the boarders of Thailand and Myanmar. Its environment ranges from slow to fast moving waters and sometimes they will inhabit heavily vegetated shorelines. This fish feeds on insect larvae and plant matter. The Red Tailed Zebra Loach has an elongated body. It will reach between 3 inches (7.6 cm) in the wild and has a life span of 8 - 12 years. This loach has a bold zebra type patterning of dark vertical bands encircling a light golden to silverish body. The bands are wider across the top and narrow as they reach the mid-section and encircle the bottom. In between them are additional thin dark bands starting just above the mid-section. There is a strong red coloring on the tail and pectoral fins. The Burmese-border Sand Loach can be hardy under the right conditions. They are not recommended for beginners because of their need for pristine water and they do not have scales. Not having scales make them more prone to disease and very sensitive to medications used to treat disease. Experience in treating scaleless fish is very important to be able to give your loach a healthy and long life. The Red Tailed Zebra Loach are omnivores that feed on insect larvae and plant matter in the wild. 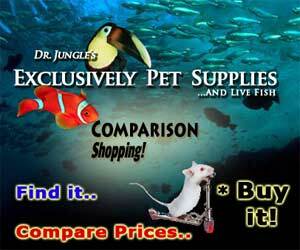 In the aquarium they will generally eat all kinds of live foods, sinking pelleted and tablet foods, flakes, and algae. They like frozen foods as well. To keep a good balance give them a high quality flake or tablet food everyday. Feed mosquito larvae, brine shrimp (either live or frozen), tubifex, daphnia, and some vegetable foods such as algae wafers. For this loach to thrive it is important that the water be clean and well-oxygenated. Weekly water changes of at least 30% are needed to keep the loach healthy. When doing your weekly water changes make sure to use a gravel vacuum to clean any excess food or waste from the substrate. These fish will be seen grazing on algae on the sides of the aquarium, so it is best to let the algae grow on the none viewing parts of the tank. A magnet algae cleaner normally does a great job in keeping the viewing pane clear. These fish are mostly bottom dwellers, but will be seen grazing on algae on the sides of the aquarium. Because these fish do best in groups, a larger tank will work best, at least 30 gallons. The tank needs to have ample hiding places for this shy fish to retreat such as rocks, caves, and roots. They do best in soft, slightly acidic water. It is recommended to have a tank set-up that resembles its natural habitat, moving rivers. The substrate should be sandy or small smooth gravel. Larger smooth rocks should be used as hiding places. Driftwood and branches should be added to provide shade and places for quick retreat. Java Ferns can be introduced and will attach to the decor. Powerheads or a rivertank manifold can be added to provide a unidirectional flow to simulate its natural habitat. Will appreciate cooler conditions due to country of origin. The most important thing for these loaches is that they always have clean and well-oxygenated water. An over sized filter will meet that requirement. The tank water turnover should ideally be in excess of 20 times per hour. A high quality canister filter works great and will clean as well as help create water movement. Installation of a rivertank manifold is recommended, though not essential, as it would not only provide an excellent alternative/additional form of filtration but bring with it the benefit of unidirectional water movement and more closely simulate what the fish experience in nature. Powerheads and airstones can also be introduced to help achieve proper flow and oxygenation in the absence of such a device. Minimum Tank Size: 30 gal (114 L) - Water changes of at least 30% weekly. Substrate Type: Sand/Gravel Mix - The substrate these fish prefer is smooth sand and gravel. The Red Tail Zebra Loach can be a good community fish as they will generally tolerate other tank mates. They tend to be reserved so it is recommended that they be kept in groups of at least three, with larger groups of five to seven acclimating easier than smaller groups. This fish is very territorial however, and they will get snappy with other members of their own species and often other tankmates as well. If the aquarist intends upon keeping it with its own kind or other bottom dwelling fish, the aquarium should be set up with room and markers for the individual\'s territories and things to break the sight line to avoid constant confrontation. Temperament: Semi-aggressive - These loaches tend to be territorial. Same species - conspecifics: Yes - They are territorial and will go after and nip at each other. Males have noticeable suborbital flaps. They are not yet bred commercially. There are reports of breedings in Thailand but little is known of their breeding habits. The Red Tail Zebra Loaches are scaleless and prone to disease, so take caution when introducing these fish to an established tank. The Salween Hillstream Loach is also very sensitive to medication to treat many diseases, a separate hospital tank is needed. Cold water and condition changes can also cause stress to this fish which makes them even more prone to disease. Loaches are more susceptible to disease than other aquarium fishes, which may have to do with the faint body scales and no head scales. The most common disease that this loach is susceptible to is Ich. Ich is short for Ichthyophthirius, also known as "white spot disease". It is a parasite that can attack nearly all aquarium fishes, but you'll find that loaches are often the first to be attacked. Take great care in treating ick as loaches are very sensitive to the medications used to treat it. Often the dose is half of what is normally used. The second most common thing that affects loaches is something called skinny disease. This can be diagnosed fairly easily. If your loaches are eating a nutritious diet and in healthy amounts, and still seem to be loosing weight, there is a good chance they have skinny disease. This disease is caused by internal parasites and can be treated with medication if used carefully. An outbreak of disease can often be limited to just one or a few fishes if you deal with it at an early stage. When keeping these sensitive types of fish, it is common to catch deteriorating water conditions and disease before other fish are affected. The best way to proactively prevent disease is to give your Burmese-border Sand Loach the proper environment and give them a well balanced diet. The closer to their natural habitat the less stress the fish will have, making them healthier and happy. A stressed fish is more likely to acquire disease. The Red Tailed Zebra Loach is only occasionally available, but makes a very interesting addition to the aquarium when you can obtain them. About a year ago, I purchased two pale little loaches that came in as contaminants in a shipment of other fish. Being a loach enthusiast, I recognized them as something different, but was not able to ID them right away. By the following day, after placing them in QT, they had coloured up so much I scarcely recognized them, displaying many dark stripes and a red tail. This became especially apparent when I dropped food in the tank, and was then able to identify them as Schistura Mahnerti. They ate ravenously at first, and "caught" their food in a lively and entertaining way. None of the food reached the bottom of the tank. As the food was floating down, they would jump into the mid water column and do loop-de-loops to catch it. For the first while, these two fish were very social with eachother and could be seen playing and resting together. They are now adults, and have reached a size of about 2.5" each. Their colouration is spectacular with their dark stripes and red tails, though one has become significantly darker than the other. Even though I have them in a 4-ft, 55 Gallon tank, there are occasional territorial squabbles, the latest resulting in a 2mm wound in the side of the lighter-coloured fish. However, the two Schistura are very friendly towards the other fish and loaches, sharing their underlog territories with kuhli, pepper, and weather loaches. Each fish has claimed a log on opposite sides of the tank, spending most of the day resting there and darting out occasionally to look around or to eat. I would not classify this as a social fish with those of its own kind, though it can be tolerant and even friendly with other species. If another injury results, I will have to consider splitting them up. Other than that, this fish has been an interesting and entertaining addition to my loach community. I would reccommend it to those who can provide clean water with reasonable flow. At least 4ft. of space, and even more I would recommend for more than one individual. I am planning on upgrading to a 75 Gallon, and will see if the increase in width of the tank will make a difference in their territorial skirmishes, though I have a feeling it is the length that makes the difference. Be sure to provide a secluded territory for each fish.